Konik refugee camp has been operating in Montenegro since 1994. Its mostly Roma and Balkan Egyptian inhabitants live in appaling conditions, forgotten by nearly everyone. Housing waiting to be occupied in Konik refugee camp. Photo by Toms Bass. Quality, inclusive early childhood education and a broader effort to desegregate public schools have been top priorities for the Roma Education Fund (REF) in Montenegro. A recent push to consolidate gains in school attendance and enrollment with improved educational outcomes within its activities is part of REF’s strategy to help Roma students to attend and graduate from high school. 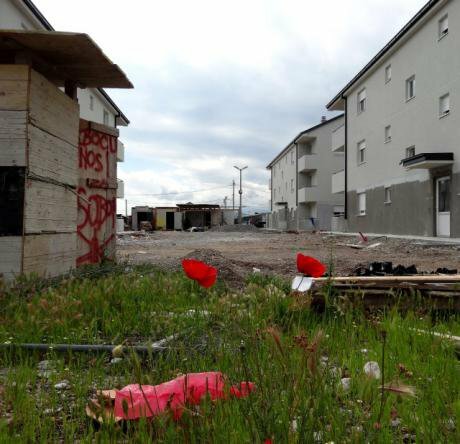 REF made a significant step for Roma in Montenegro in 2016 when it managed to close a segregated school at Konik, Europe’s longest operating refugee camp. 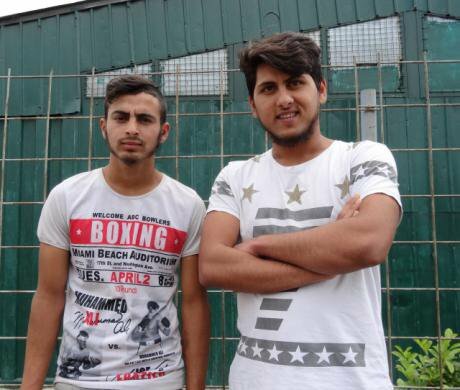 Established by UNHCR as a response to the Balkan Wars, Konik Camp has operated in the eastern district of the city since 1994; by 1999 the camp became a refuge for Roma and Balkan Egyptians fleeing violence in Kosovo. Disarmingly ramshackle and exceptionally compact, Konik exists as a semi-autonomous zone with its own logic and laws, and outsiders do not gain access without reason – in REF’s case, an open invitation since 2006 to bring about sustainable change to education outcomes for Roma and Balkan Egyptian children. Imagine that you’re uprooted from your home overnight. Imagine that you flee in your socks with your family over a mountain pass. Imagine that you arrive, safe, to an ambivalent welcome in a refugee camp. Imagine that your shelter for the first months will be a canvas tent, years later replaced by a shipping container that is either blistering hot or bitterly cold. Imagine that it takes all day to wash your laundry and cook your meals. Imagine that the social assistance you receive is little better than the wages you might earn, so you prefer to salvage what you can from around the city rather than bother with a job. Imagine that there is no exit from your situation, that the limbo you are stuck in appears to have no resolution and no end. Imagine that your children born in the camp are neither citizens nor residents but ghosts. Imagine that what counts for a school is a guarantee that your children will have less of a future than yourself. Imagine that one of them is terribly, terminally sick. Imagine that you always fear fire, police, floods and intruders. Imagine that your neighbour is funding her drug addiction by selling her children into prostitution. Imagine that you have nowhere to turn and that everyone you know is in the same situation as you, until, like magic, someone appears at your door and asks how you are, what you might need and how s/he might help. It strikes you as a funny question after so many years of struggling. You automatically answer that you’re fine, but your face betrays your years in the camp. You point to your children who you know are brave and bold and smart, and you look at the carcass of the camp school and you shake your head. It’s not going to happen there. You look toward the town and you shake your head again. There might as well be an ocean between you and them. Last time I slept on the street in the snow in Belgrade while she was in hospital. I was sick for two weeks. But we must do everything for our children. If you can conceive of all this – if you can acknowledge and then dismantle all your privileges like sanitation, running water, quality housing, good education, reliable healthcare and solid prospects for life ahead – then you might have an idea of what life is like for the residents of Konik Camp, trapped since the end of the Kosovo conflict in an administrative and physical limbo for 18 years that perpetuates their exclusion and makes planning for a common future nearly impossible. Bounded by a suburban neighborhood and seguing into a poisonous hinterland that adjoins the municipal dump, Konik Camp has hardly any sanitation or utilities. It’s easy to see all the stereotypes of poverty in one glance. Signs of hope and despair pepper an area occupied by people managing with what little they have, whether pushing rain water out of the gutters, tending cooking fires or washing at the camp laundry. At one entrance, salvagers break apart greasy truck engines. Along another boundary, a renovated kindergarten for two REF-supported classes of Konik preschoolers. Then a rundown block of flats built for refugees during the early years of the camp. Then newer permanent housing of cramped flats often occupied by eight or more family members – many of whom are outside during this bright, sunny moment between thunder showers. In between, 100 new housing units funded by the OSCE wait to be occupied by those still living in containers, waiting to see if their number will come up in the lottery run by the Ministry of Social Security. The impact of years of displacement is palpable for many, both young and old. Ali, a robust 60-year-old from Peja/Pec in Kosovo, described the moments before he left Kosovo. Ali’s family was not alone in facing hard choices. Ask any elder in the camp and they will tell you the same. For over a decade, step by step, REF has been working in phases to embrace children and families within its vision of integrated public schools and wider Roma inclusion in Montenegro. With many young children born in absolute poverty within the camp population, the first priority was to offer support to improve early childhood milestones, with interventions tackling basic nutrition, hygiene and parenting skills. REF also provided second chance programs for young adults who were functionally illiterate in an attempt to ameliorate their labor market prospects. While these are panacea for systemic problems affecting its residents (unclear residency status, denial of right to work, punitive social assistance schemes), REF did not take its eyes off the prize: embedded in the camp an elementary school provided only the resemblance of an education: a dumbed-down curriculum, substandard teaching and classed filled with multiple-grade repeaters, with attendance substituting for performance. Two high school students in Konik refugee camp. Photo by Tom Bass. REF realized that there was an opportunity in Podgorica. The government of Montenegro, keen to make a favorable impression in its run for EU membership and bound to the human rights requirements of the acquis communitaire, would be prompted to act. REF began to lobby the Ministry of Education to do something. Armed with evidence of what could be achieved with small investments from a portfolio of award-winning grants, REF persuaded the Ministry that the branch school should close, whereby the upper grades would be phased out at first, gradually transferring students grade by grade into Podgorica’s mainstream schools. While the prospect of finishing primary school was very low for children who had spent too many years in the unruly branch school, younger students are being given an unprecedented chance to show how their resilience can help them catch up. Those within REF’s immediate orbit like Vjolca have been persuaded to become Roma mediators. An enthusiastic participant in REF’s earliest literacy empowerment sessions, she was encouraged to take a larger role, bringing neighbor’s children to the storytelling, reading with them or their mothers, slowly building their confidence and cognizance. She found that she had a lot to share and could play an important role near the camp. Within earshot of the camp and adjacent to its Montenegrin office, REF runs a Toy Library and play room for children under age six. Here, Vjolca spends most afternoons, leading the Your Story sessions that she herself attended years ago. Mothers and their children come here almost daily to read stories and share their experiences, as cultural values demand that most Roma and Balkan Egyptian women remain at home with their families. “I started at the Toy Library and the children were interested in only the toys, but now we all check out books,” she said. Vjolca is just one of a dozen mediators assuring that Roma and Balkan Egyptian children from the camp reach early childhood milestones and later enter the mainstream school system. She is matched by strong women like Stipe Kabashe who are responsible for a group of children every morning and accompany them on the bus to school or unconventional men like Asterix Besnik who do the same thing, believing that education is the only worthy strategy for 319 elementary schoolers to exit from the camp. Their smiling and enduring presence proves one development cliché to be absolutely true: that people do make a difference, and in the greatest of ways, through dedication, respect, sensitivity and commitment. Whether it’s Marijana who advises on every aspect of early childhood education, or Admir who organizes the transport and tutoring, or the team seconded from the Ministry who are administering secondary school scholarships for Roma and Balkan Egyptian students that number 64 this year and are bound to increase to 100 in the next. No matter where you turn, you realize that something can be done, and with the small efforts of everyone on the team, something as difficult to solve as Konik Camp can be impacted through small steps. But it’s not all rosy. Years of poor health have had a drastic effect on some of Konik’s children. Vjolca’s daughter Isabel is among those suffering from a debilitating, brutal disease. The pain is written in Isabel’s face and movements, yet still she smiles and goes to school. “She doesn’t know what is a game,” her mother added. The family is waiting for the operation, the miracle, that will end the pain and return her to a normal girlhood where Anna and Elsa are princesses forever and where becoming a teacher or a hairdresser are achievable goals. In 2017, over 50 children attend kindergarten, 319 children a day are bussed to nine schools around Podgorica, and 64 high school students received scholarships and academic support. REF, together with its lead partner, Help e.V., is funded until 2019 through the EU Delegation to Montenegro under an Instrument for Pre-accession Assistance.